This week I have chosen to highlight some healthy beverages which are kid friendly. In our family my little one is easy to please when it comes to any cold beverages. We all know and accept the health benefits and cooling effects of both cucumber and buttermilk. To combine both and make it an enjoyable treat, is brilliant. So when I was looking for healthy summer drinks, I came across various version of kheera lassi and that gave me an idea to make it for my little one. To accommodate her palate, I omitted green chilies and mint, though I garnished with mint. In fact she would have sneaked in a few drops of lime juice as well in her glass :). My husband, on the other hand wanted the green chilies in his lassi. Blend all the ingredients into a smooth mixture. Serve in individual glasses. Sprinkle all the garnish ingredient as needed and serve. Never tasted it but just the name sounds refreshing. A hint of chili peppers and mint sounds great. Mu husband was sitting around and asked him whether he has ever heard about cucumber lassi. He said that the first thought that came to his mind was that it would be one refreshing drink. Going by the ingredients, I am sure that we are definitely going to love it and will give it a try. This is one of the versions that are made during May/June in our Office. Our cook makes it quite spicy with the green chilies. I know the grated/cubed cucumber tastes great...very good one to make for kids. What a perfect drink for this heat. The combination of yogurt and cucumber is so good and when added with spices, this must taste amazing.. This is a favorite way to enjoy summer drink. One of the best thirst quencher and love all the flavors. I would make a large batch of it and keep in the refrigerator to enjoy! Looks so refreshing,never tried on my own.But had it couple of times in a friend's place and kids even liked it. How refreshing this drink looks. Prefect summer drink to please ourselves while the weather is too hot outside. Cucumber lassi is new to me , we do make cucumber raita , but never a lassi . Awesome recipe and a real soothing one . Will try it asap . This is indeed a very refreshing and healthy drink....perfect for summers. Thats a super-cool and refreshing Lassi. 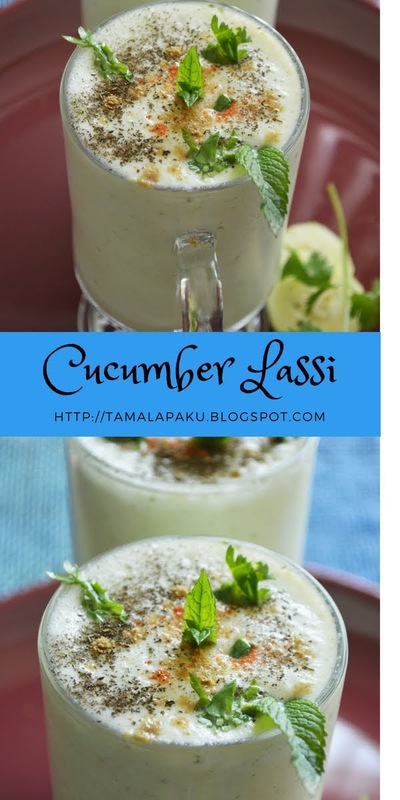 Though I make Cucumber raita often, havent tried Lassi with that. Nice combo! Pics are so beautiful too! Such a refreshing a cooling Lassi perfect for the summer with cucumber!! Very refreshing drink Harini!You have presented it beautifully! My kiddo likes curd so I secretly make him eat cucumber by serving as a lassi!! That is such a perfect summer drink...looks so refreshing and delicious.